Tracy Johnson’s story is inspirational and she tells it with humility, grace, and vigor. “…one college counselor told me that I should give up. Discouraged, but not defeated, I worked years as a custodian, cleaning school buildings for the Philadelphia School District. I knew I had more to offer and that I could be more. Yet everything and almost everyone around me focused on my limitations and not my potential. Raised in Philadelphia PA by a single mother, Tracy’s early experiences in public school were discouraging. Her struggles with reading led to an eventual placement in special education classes. Tracy Johnson has prevailed against numerous life challenges. Naysayers urged her to drop out of school and college because of her learning disability. Instead, Tracy turned challenges into victories, overcoming poverty and very limited support. Today Tracy is an accomplished lecturer and advocate for people with learning disabilities—particularly dyslexia. She received her Masters Degree in Multicultural education from Eastern University and undergraduate degrees with honors from Harcum and Cabrini colleges in Pennsylvania. 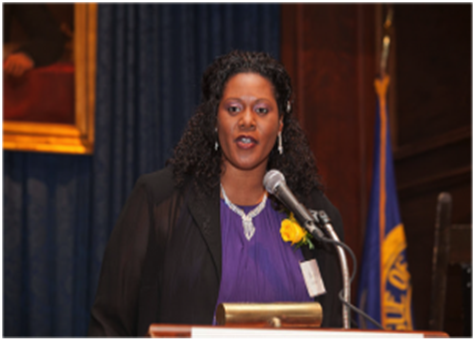 Tracy is the President and Founder of Vessels of Hope, a mentoring and networking organization for minorities with learning disabilities. Ms. Johnson is a much in-demand speaker, whose personal journey to academic excellence and achievement, has inspired a large number of individuals with dyslexia and/or other learning disabilities, parents, educators, legislators, civic and business leaders. She is one of a number of individuals featured in the highly touted HBO documentary film, Journey into Dyslexia: Great Minds Think Differently, released in 2011.